Whew, quite a week of news, eh? The Manafort verdict has stuck with me, if only for this detail. The jury couldn’t come to unanimous agreement on 10 other counts and a mistrial on those charges was declared. Ms. Duncan revealed that there was just one juror who held out on conviction on those counts, citing reasonable doubt. The other eleven jurors were convinced of Mr. Manafort’s guilt. I don’t know why that juror held out, so let’s instead consider a hypothetical. Earlier, I argued that Democratic and Republican voters were more polarized than first appeared because roughly 10-20% of the population can be convinced of nearly anything. The first juror in the Manafort trial to out themselves bought pretty heavily into some of Trump’s conspiracy theories, so they must have some grip on the general public. What if this 10-20% of the populace was so deep into these theories that they’d never find one of Trump’s associates guilty? That would be a huge problem if they were on a jury. What are the odds of such an event occurring? We can calculate this ourselves, via the Binomial distribution. 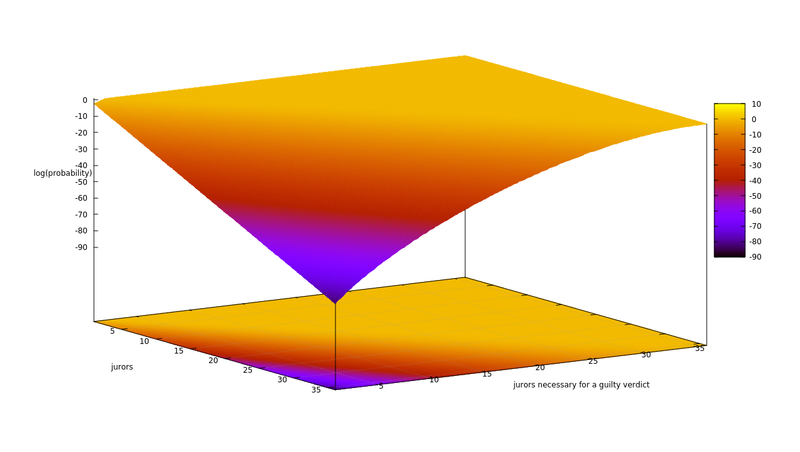 Assuming a 12-person jury, if 10% of the population would refuse to convict under any circumstance, then there’s about a 72% chance of at least one such person being a juror; if 20%, then there’s a whopping 93% chance. Since the US Federal courts require unanimity to reach a verdict, those are also the minimum odds of a mistrial on one count! The good news: you can drive t to be as low as you wish. The bad: you accomplish that by inflating the size of the jury pool while keeping the quorum low, which means the weight of the evidence necessary to convict drops. Avoiding partisan bias means more false convictions, and vice-versa, so we have to calculate our preferred trade-off. How many guilty people should be allowed to walk free? How many people should be convicted of a crime they didn’t commit? How much should we invest into those who have been convicted of a crime, and how should we spend those funds? How much should we spend on crime prevention, and which programs are the most effective? For instance, its been estimated that at least 4.1% of all convicts given a death sentence in the US were falsely convicted; is that rate of killing innocent civilians acceptable, or should it be lowered? Of the hundred thirty-seven prisoners freed from US jails in 2017, their average time behind bars was 10.7 years; is putting an innocent person behind bars for that length of time something we can tolerate as a society, or should it be lowered? If it should be lowered, are we going to do that by doing more aggressive post-conviction audits, better training for police and prosecutors, both, or are there more effective tactics out there? Working out this math also changes our judicial philosophy. If we build our system so that it punishes the guilty, then our false conviction rate had better be low. If instead we build our system so that it makes them better citizens, then putting an already-good citizen in there isn’t a big loss and we can instead tune other variables. The only real choice here is if we consciously put those numbers in place ourselves, receive a nasty shock when we later calculate them, or pretend those questions don’t exist. Currently, we’re doing a lot of the last two in Canada and the US. I don’t to come across as a predictive genius. Just today, in fact, I guessed that Manafort’s verdict would land today, and he’d be found guilty on most of the eighteen counts. Former Trump campaign manager Paul Manafort has been convicted on 8 of 18 counts by a federal jury in Virginia, and a mistrial was declared on the remaining 10 counts when the jury deadlocked. See? I was one short of “most.” That note from the jury threw me off, I thought it indicated more consensus than there was. Anyway, the guilty convictions were for multiple years of tax fraud and a touch of bank fraud. It’s a bit disappointing, as he’s likely guilty of a lot more, but those guilty verdicts alone could carry a maximum of 80 years. And “deadlocked” isn’t the same as “not guilty,” the rules allow prosecutors to try again. While they must be feeling a bit sore about the judge they got, between the guilty verdicts they got and Manafort’s second trial in a few weeks those prosecutors are probably more soothed than sore and content to let bygones be bygones. The deadline’s a week from now, so we won’t have to wait long to learn how that prediction turned out. As for Michael Cohen, I was telling everyone to beware of all the spin in the air and wait for more concrete steps. Cohen pleaded guilty to eight counts: five of tax evasion, one of making a false statement to a financial institution, two related to illegal campaign contributions. Looks like the early reports were more accurate than I gave them credit for. I definitely recommend giving the plea agreement charging document a read, it’s a trip. 1. From in or about 2007 through in or about January 2017, MICHAEL COHEN, the defendant, was an attorney and employee of a Manhattan-based real estate company (the “Company”). COHEN held the title of “Executive Vice President” and “Special Counsel” to the owner of the Company (“Individual-1”). 27. In or about August 2015, the Chairman and Chief Executive of Corporation-1 ( “Chairman-1”), in coordination with MICHAEL COHEN, the defendant, and one or more members of the campaign, offered to help deal with negative stories about Individual-l’s relationships with women by, among other things, assisting the campaign in identifying such stories so they could be purchased and their publication avoided. Chairman-1 agreed to keep COHEN apprised of any such negative stories. 37. In or about January 2017, MICHAEL COHEN, the defendant, in seeking reimbursement for election-related expenses, presented executives of the Company with a copy of a bank statement from the Essential Consultants bank account, which reflected the $130,000 payment COHEN had made to the bank account of Attorney-1 in order to keep Woman-2 silent in advance of the election, plus a $35 wire fee, adding, in handwriting, an additional “$50,000.” The $50,000 represented a claimed payment for “tech services,” which in fact related to work COHEN had solicited from a technology company during and in connection with the campaign. COHEN added these amounts to a sum of $180,035. After receiving this document, executives of the Company “grossed up” for tax purposes COHEN’ s requested reimbursement of $180,000 to $360,000, and then added a bonus of $60,000 so that COHEN would be paid $420,000 in total. That’s a violation of campaign finance laws aimed at influencing the 2016 election, in consultation with a presidential candidate, his team, and said candidate’s business. As if that wasn’t bad enough, Cohen’s lawyer followed up with a one-two punch. Before the Lanny Davis news, though, I’d predicted that Trump’s West Virginia rally would be off the hook. Trump has concluded after about an hour and 15 minutes, longer than usual. No mention of Cohen, Manafort, or Mueller, and less time spent on the Russia probe – just a couple sentences – than at most events. Phooey, and the pre-show was so promising. Both the Manafort and Cohen verdicts were handed out within minutes of each other, and a mere two hours before Trump’s rally, so the silence may simply be because he didn’t have time to absorb what was happening? Maybe instinct kicked in, and Trump realized anger would only make him look more guilty? Or maybe visions of pardons are dancing through his head? It’s still too early to be sure, but nonetheless that’s another flubbed prediction. Ah well, back to that post on probability theory.